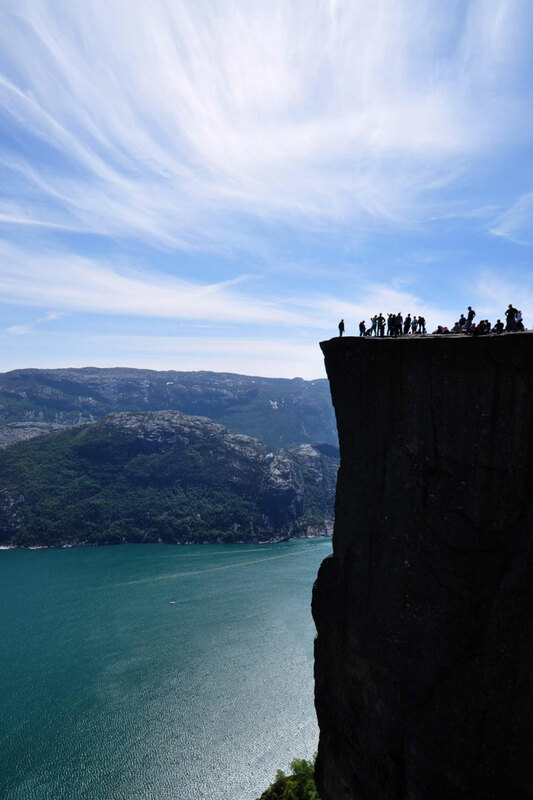 One of the iconic sites of Norway, Preikestolen (or Pulpit Rock) is a square and almost flat outcrop with vertical sides plunging 604m down into the beautiful Lysefjord. 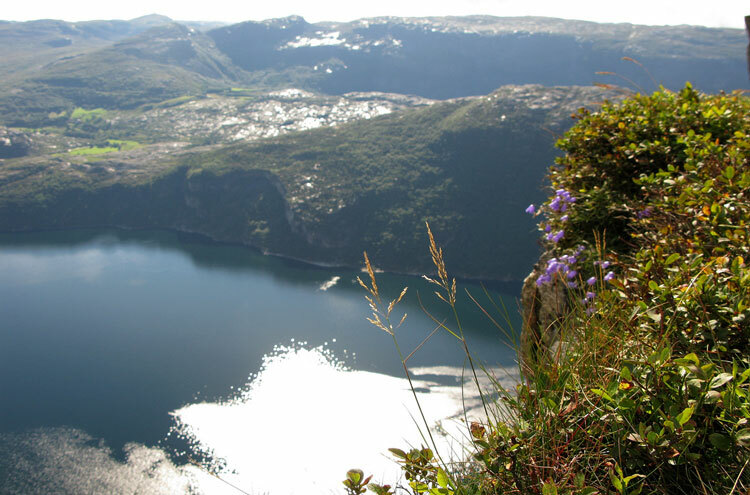 The views along Lysefjord from the top are some of the finest you will see anywhere. 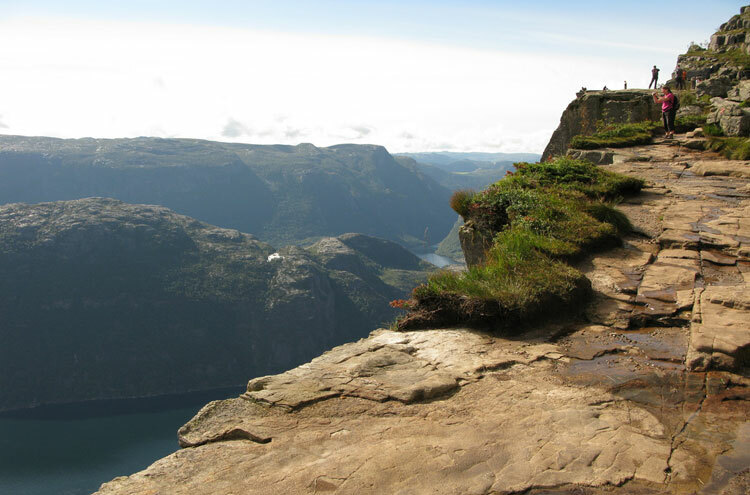 In the summer months, throngs of tourists descend on Preikestolen, so don't expect solitude. 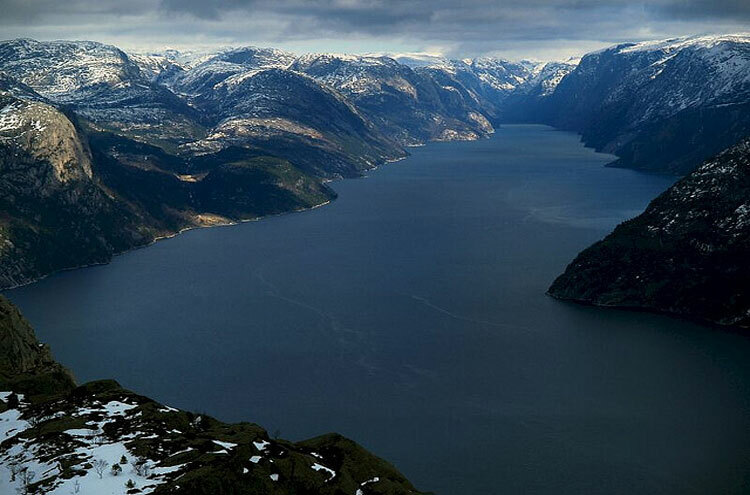 The astounding Lysefjord in south-west Norway is a spectacular flooded valley, the sea eagerly swallowing up land as retreating ice relinquished it. Glaciers carved this landscape, and still act upon vast swathes of it. 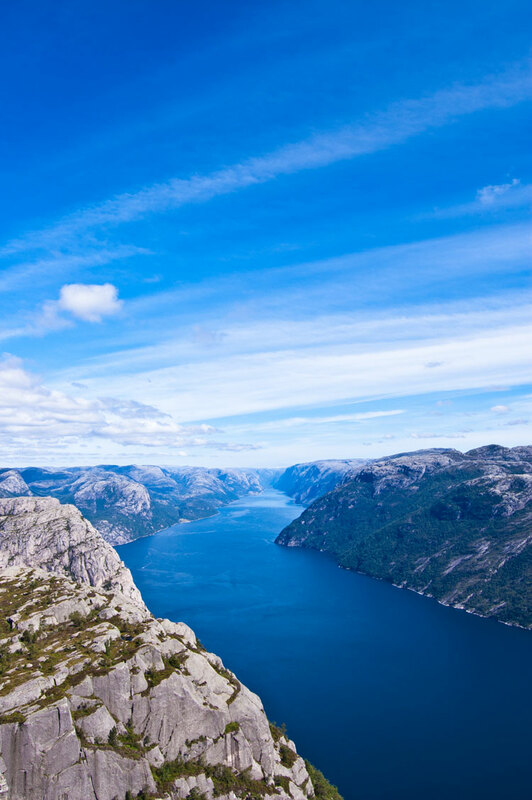 Enclosed by snow-laden mountains on all sides (for much of the year), vertiginous rockfaces plunge down to the fjord's very shores from hundreds of metres up. 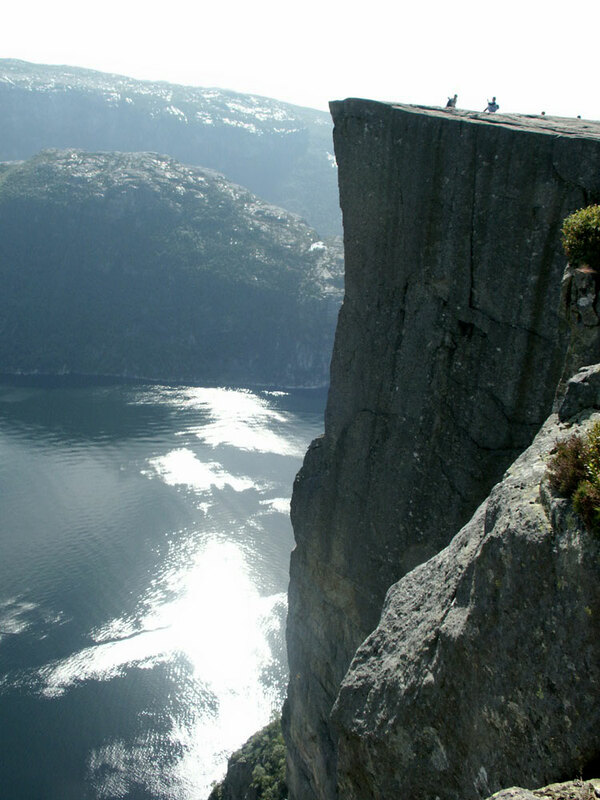 The mountains themselves are yet higher: Kjerag, on the fjord's eastern end, tops 1,110m. 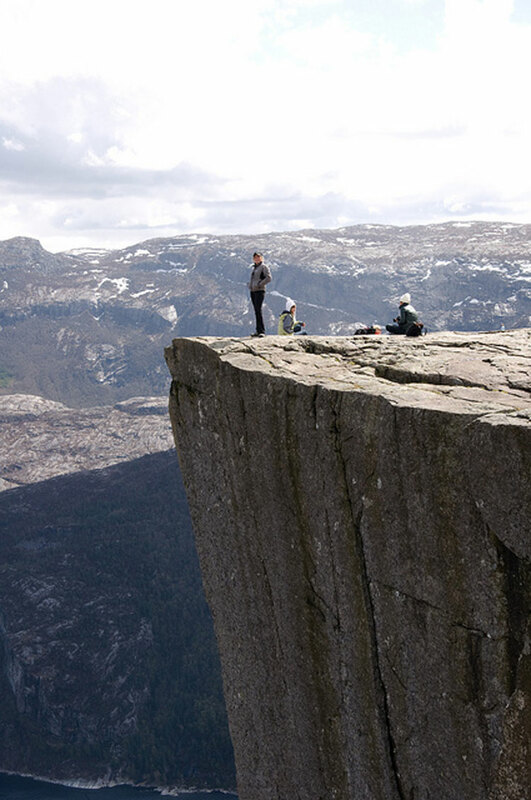 The most famous feature, however, is Preikestolen, the Pulpit Rock. This solid spur of granite stands majestically across the fjord from Kjerag plateau, a mere 604m up (gulp! ), but those metres sheer and smooth. Its precipitous cliffs are the pull for thousands of visitors each year, mostly crammed into three or four summer months, so don?t expect solitude. 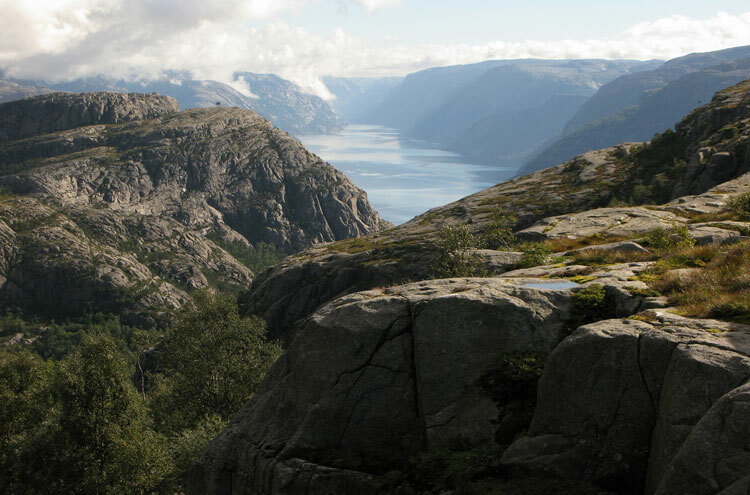 Views from its near-flat, 25m x 25m top take in the length of the fjord, some 23 miles, while ridges sharpened by frost-shattering sweep away and up in every which direction. 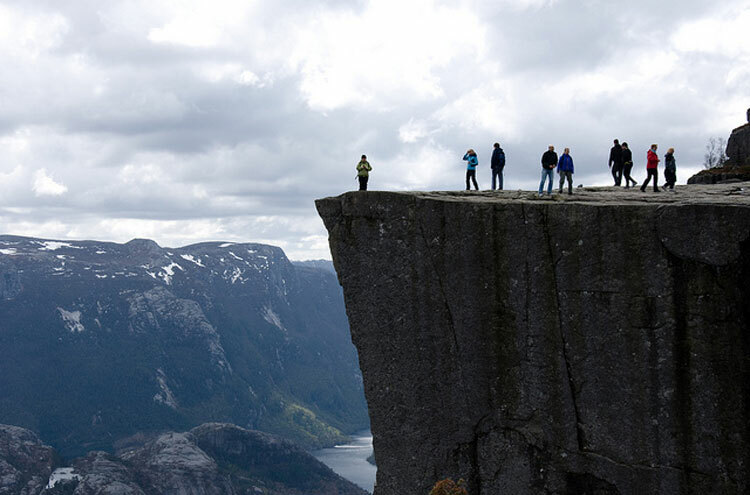 Preikestolen?s odd smoothness actually comes from this same action: during glaciation, frozen water pried off vast oblong blocks along intrinsic fault lines. Now, the planes of the dramatic excrescence are in stark contrast to the surrounding jagged peaks, giving its old local name of Hyvlatonna ("the carpenter-plane's blade"). The ideal picnic place, then, is at the furthest point along the out-and-back route, high above the lake's deep waters. It is said that a "mystic voice" gives hikers a strange desire to leap from the edge - clearly an international phenomenon, as similar also happens on Emei Shan in China. 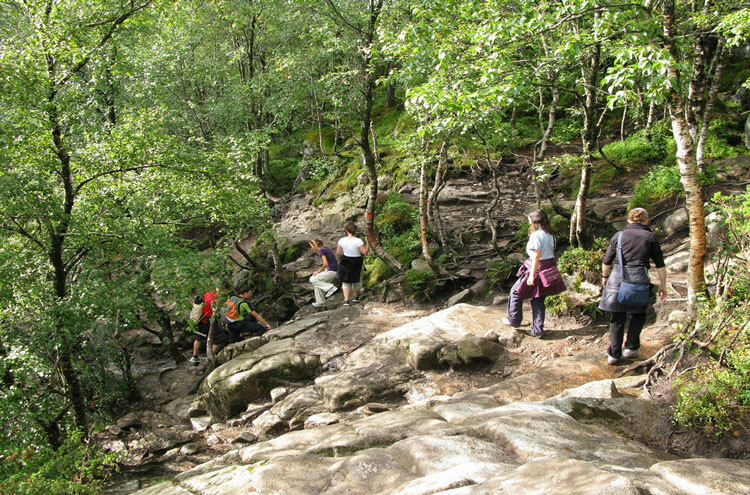 Trek the four kilometers from Preikestolhytte car park to the outcrop; a decidedly treacherous, and steep, and demanding, path - despite a relatively small height gain of c.300m. The track is well marked, as with many Norwegian trails, a red 'T' painted on rocks en route. Alternatively, higher but with less prestige: Kjerag. 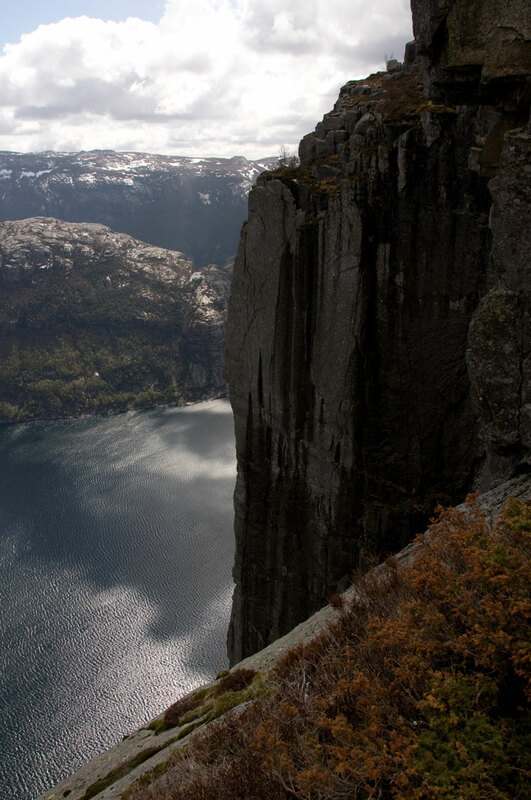 Although 1,110m at its peak, its north face gives a similar vertigo to Preikestolen. It does have its own idiosyncrasy, however. Kjeragbolten is a 5m3 rock plugged into a gap between two slabs. It is jumpable, but only for the brave, and Walkopedia is probably a bit too chicken. A number of ascents are to be had, perhaps the easiest that from Oygardsstolen visitor centre. 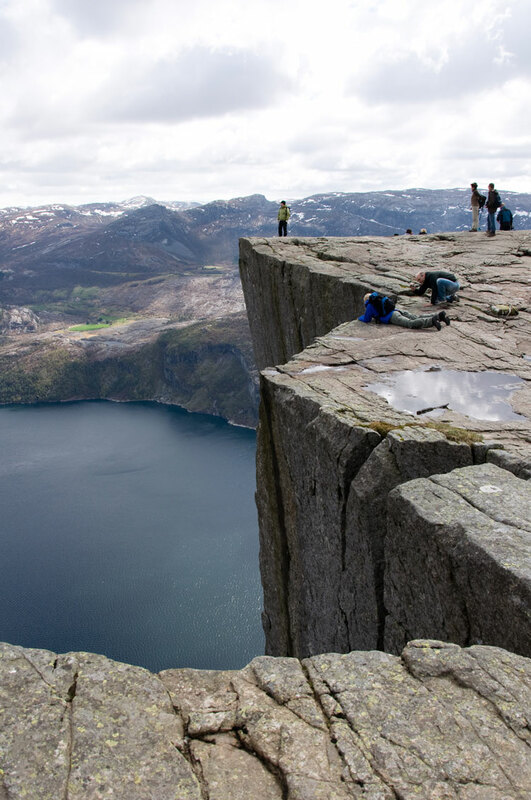 The Kjerag option is far better for solitude (though by no means guaranteed, with others too avoiding the Pulpit Rock's crowds), and with the added benefit of a panorama including Preikestolen. 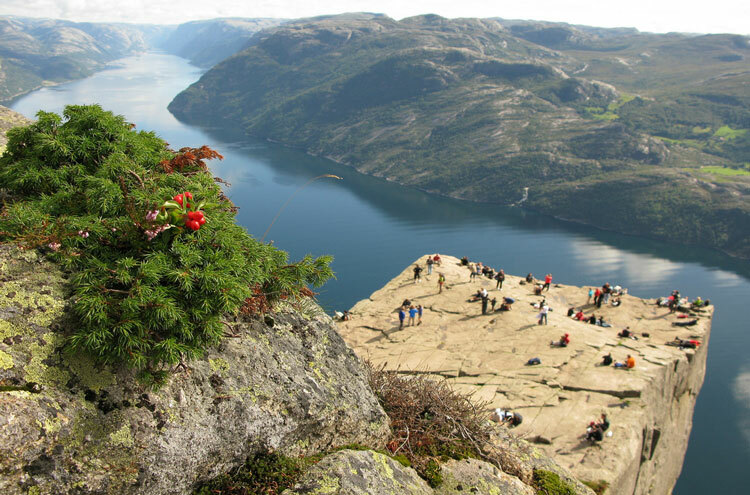 Perhaps the best bet, then, is both: Preikestolen's 3.8kms (brunch on top? 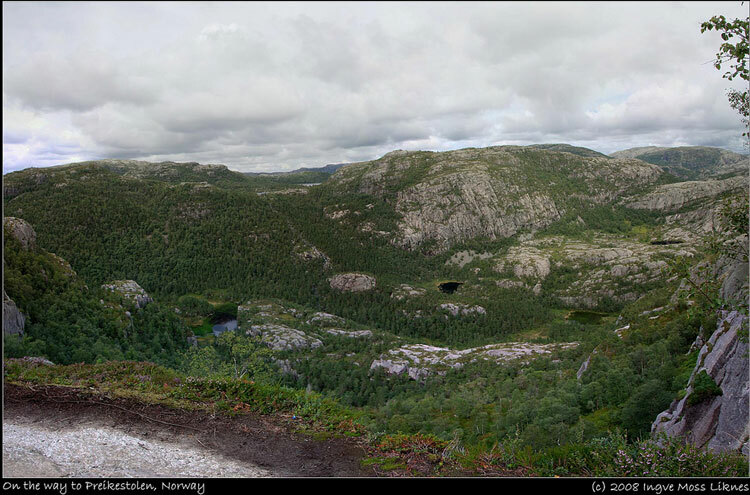 ), then back down, and then around by road to Oygardsstolen visitor centre and the Kjerag walk.